About 40 years ago, Brian discovered that photography provided a powerful means for expressing his vision of the world. Over the years, his love of the outdoors and photography as well as an aptitude for computer technology have morphed into a passion (some would say obsession) for capturing the elegance and majesty of the unique landscapes, wildlife, and flora of the United States. While the pursuit of nature takes him all over the country, he favors the west, northwest, northeast, and mid-Atlantic and, wherever he is, his love of hiking and backpacking takes him far beyond populated areas into settings which few people visit. Brian’s images are in private residences and corporate offices and have appeared in regional magazines such as Wonderful West Virginia. Corporate clients have also used his images for promotional and internal publications. Brian has been teaching workshops, field trips, and classes and speaking to camera clubs, schools, and other non-profits for over seven years. He recently reached a milestone: Brian taught Lightroom to his 500th student. Brian is well-known for his ability to distill complex topics to their essence and explain them in simple, easy to understand ways and he just completed his opus presentation on digital technology, Digital Tech: Concepts to Know if You are a Digital Photographer. 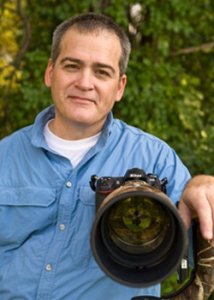 Brian uses whatever camera and equipment will allow him to capture his vision for the subject in front of him. He generally uses Nikon cameras, Nikon and Sigma lenses, Induro tripods and ballheads, and all sorts of accessories. His favorite camera is the full-frame Nikon D800E and favorite lens is the Nikkor 85mm f/1.4. The D800, with its 36 megapixel sensor, makes printing BIG images easy and the 85mm, with its f/1.4 minimum f-stop, makes creamy backgrounds a foregone conclusion. However, when headed downtown or just around town, you are likely to see him with his Fujifilm XE-1, which is lighter to carry and easier to conceal in his jacket. The occasional use of Zero Image pinhole, Holga, and Lomographic cameras provides him with an expanded array of ways to express himself and a respite from complicated cameras, heavy lenses, and the need for batteries. He manages his digital workflow using a MacBook Pro, with most of his images being lightly edited using Adobe Lightroom, Photoshop, and various plug-ins. He also uses Photomatix Pro and Nik Software’s HDR Efex Pro for HDR imaging, various stitching applications for creating panoramas, and Apple Keynote and Boinx FotoMagico to create multimedia presentations.